Lutheranism in Baltimore had its beginnings in 1760 when a group of members of the German Reformed Church withdrew to establish the first German Lutheran Church. This was located on Saratoga Street. The church soon outgrew its building, moving to Gay and Lexington Streets in 1808. Known as Zion Lutheran, this church still stands. Friction developed over the lax attitude of the Council concerning questions of doctrine. The Reverend J. C. P. Haesbert, along with 150 members, left Zion and established a church in a building on Holliday and Saratoga Streets (1835.) This congregation became the Second German Evangelical Lutheran Church. The church grew in numbers. In 1837, a school building was added. 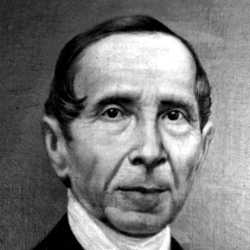 Pastor Haesbert resigned in 1844 and was succeeded by the Reverend F. C. D. Wyneken, who soon found that the practices of the church were not strictly Lutheran. A goodly number of parishioners were of the Reformed faith and would not be convinced otherwise, so he simply advised them to separate and form a church of their own. Thus the First German Reformed Church, located on Calvert Street, originated. The Lutheran group changed the congregation’s name to St. Paul. 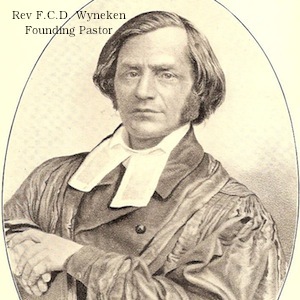 Pastor Wyneken enlarged the school and laid plans for establishing branch schools in East, Northwest, and South Baltimore. After five years of service he accepted a call from the Trinity Church in St. Louis. Because of his ability as an organizer, he was later chosen to become the second President of the Missouri Synod, which he had helped organize in 1847. As his successor at St. Paul he recommended the Reverend E. G. W. Keyl, who had been active in missionary work in the Missouri Valley and helped design the “Saxon Community” in Perry County, Missouri, birthplace of the Synod. In 1857 the congregation purchased four and one half acres of land in what is now Druid Hill Park for use as a cemetery. The cemetery still exists. By the end of 1864 the area surrounding the church was being crowded by business and many members of the church had moved to outlying districts of the city. The building was greatly in need of repair, and Immanuel Lutheran Church had been organized in East Baltimore. 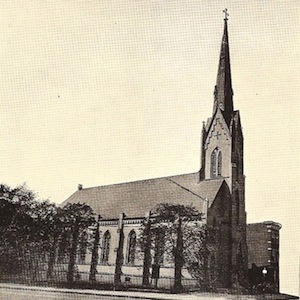 St. Paul congregation had released 75 of its voting members to this newly established congregation and with them went the Eastern District School; therefore, a decision was made in 1865 to sell the old building and build two churches, one in each of the remaining school districts. In November of that year the members living in the Northwestern School District purchased a site at Saratoga and Fremont Streets for $5,500, on which to build their church. This group was organized as a congregation on January 7, 1866. Thus a new church was born. The newborn congregation retained the name of the Mother Church, St. Paul. Plans for a new building were made immediately. The cornerstone was laid in the fall of 1866, and a beautiful red brick Gothic structure was completed the following year. The building reflected a nostalgia of the German congregation. Gothic windows and arches were predominant; arches with foliations were on each side of the chancel. At the back of the altar forming a reredos were five figures set in niches, the central carved wooden figure representing Christ, the other four representing the four Evangelists-Matthew, Mark, Luke and John. These wooden figures were imported from Germany and were representative of the art for that period. Three large bells were imported from Westphalia, Germany, for the steeple. Meantime, the Reverend W. G. H. Hanser had been elected to serve as the first pastor of the new St. Paul Evangelical Lutheran Church. On December 15, 1867, after a farewell service at 9:00 AM in the old building at Holliday and Saratoga Streets, at which Pastor Keyl preached the sermon, the entire congregation, numbering 1,000 men, women, and children, marched to its new edifice for its dedicatory service. In the afternoon, a second service was held, in which the new pastor was installed by the Reverend E. G. W. Keyl, retiring pastor of the old church, and in the evening an English service was held. In August of the following year the new St. Paul congregation was affiliated with the Missouri Synod. During Pastor Hanser’s 18 years of service, the congregation flourished and the school outgrew its quarters on Waesche Street. A tract of land south of the church property was purchased in 1869, and a three-story school building was erected. A tract of land in Violetville was donated to the congregation in 1882 for use as a cemetery, and many members transferred their dead from the old St. Paul’s cemetery in Druid Hill Park to the new site. In 1885 it became evident that real need existed for services conducted in the English language. Pastor George Johannes aided in bringing about the organization of English Emmanuel congregation in 1888. St. Paul released to it members who were no longer conversant with German or who had a preference for English. This seemed to be a happy solution of a vexing problem-the care of non-German-speaking group within the church. Other members were released in 1889 in order that they might assist in establishing a branch congregation in a growing German community in Southwest Baltimore, namely St. Thomas. By 1910 the outflow of English speaking members became so alarming that it was resolved to introduce regular English services on Sunday evenings and set up English classes in the Sunday School. In 1913 it was deemed necessary to expand the English work, calling an additional pastor, the Reverend Walter Obermeyer, who was installed on August 31st, to serve as pastor of the English contingent of the congregation. The next year marked the closing of the Parish School because of population changes in the community. Two rooms on the first floor of the school building were converted into one large room, and thereafter English Services were conducted on Sunday morning in the Parish Hall. In the spring of 1941, the congregation established a Service Center for the men of the Armed Forces-the first of its kind in this region. The parsonage at 811 West Saratoga Street, which had been vacated by Pastor Weinbach after his wife’s death, was equipped with recreation rooms and sleeping quarters. The facilities were extended to the men gratis. For the Diamond Jubilee of St. Paul congregation in 1942 the interior of the church was renovated and restored. The event was celebrated in three anniversary services and an evening of fellowship. St. Paul’s was privileged to still have in its midst six members (all women) who had been present at the dedication seventy-five years before. The congregation worshiped in the chapel until September 23, 1956, when the first unit, hereafter known as the Fellowship Hall, was dedicated. The facilities afforded by the Fellowship Hall permitted increased activities, and new members were added steadily to the congregation. A substantial increase was experienced also in Sunday School. Pastor E. H. Fastenau soon urged the establishment of a Christian Day School as part of the church’s educational program, and by the fall of 1957 the congregation decided to open a kindergarten. The church continued to grow, and it soon became evident that it was outgrowing its facilities. Groundbreaking for the new building was held on December 16, 1958, and on February 15, 1959, the corner stone was laid together with the date stone of 1866 which had been removed from the old church building. On November 8th the dedication of the new sanctuary took place. In the spring of 1960 the congregation resolved to add the first and second grade to its educational program. In 1961 a newly installed organ was dedicated to the glory of God and the third grade was added to our school. The years-1962, 1963 and 1964-saw the addition to our school of grades four five and six. St. Paul Lutheran Day School graduated its first class in June 1965, and two of its graduates entered Baltimore Lutheran High School which was opened in September. A part-time pre-school was added, which was replaced in August of 2002 by a full-time, year-round Early Childhood Center. Throughout the years, St. Paul Lutheran Church & School has been blessed by God and has used those blessings to serve God and its neighbors. We invite you to join us for worship and in our ministry to Catonsville, surrounding communities, and beyond.